This is an unusual position for a game developer to take, but there’s not really an abundance of other options here, is there? 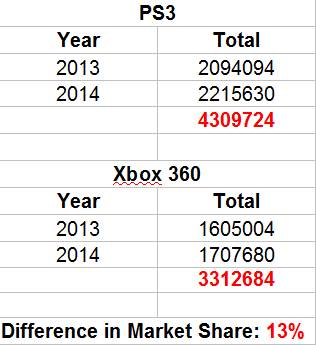 The Xbox One has been, staggeringly so, the worst selling console of this generation. While it has seen a recent uptick in sales as of late (largely due to removing features from its retail package, but that’s neither here nor there), it is still being outsold by the Playstation 4 at a two-to-one ratio. 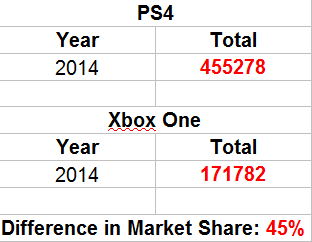 It trails even the underperforming Wii U by over 1.5 million units. With Sony having just announced that they’ve passed the ten million consoles sold mark, Microsoft’s recent numbers indicate that they have shipped merely five million consoles. Exclusivity on the Xbox One, therefore, is automatically snubbing a pool of five million more potential consumers simply in the Sony vs. Microsoft theater of console warfare. That’s without factoring in all those who would have purchased the game on PC, and the possibility of sales on the Wii U. But okay, let’s give them the benefit of the doubt here. Maybe Tomb Raider actually sold better on Microsoft consoles during its 2013 reboot. If that’s the case, then the cost to port to another system could potentially be greater than the projected profits on that system if it had historically sold poorly there. Yeah, that would make sense. Let’s take a look at the numbers, then. Oh. Well, that’s probably not fair, that was then and this is now, after all. It’s a new generation, and that’s where the competition will be, so let’s look at how Tomb Raider is doing on the new consoles. Well… what the hell, Square Enix? Sure, it’s very possible that the bean-counters over there have additional metrics that I’m not seeing. Maybe they’ve got super fancy forecasting equations that I couldn’t even begin to comprehend. Maybe the deal they struck with Microsoft was profitable enough for them to ignore the hundreds of millions of dollars in revenue the game could bring in on other platforms. Maybe they have a monkey that advises them on release strategies by throwing his feces at a dartboard. My money’s on that last one, personally. But I suppose I just don’t see the logic here. The way the industry works right now is that budgets for AAA games like this are ludicrously bloated; they cost hundreds of millions of dollars to produce, and that results in the ugly reality of every game needing to be a mega-hit in order to turn a profit. Everyone is chasing the Call of Duty sales figures, and pouring more and more money into the development cycle in pursuit of that ludicrously lofty goal. Even after releasing to the best sales numbers ever for a Tomb Raider title, and being one of the most purchased games of the year, Tomb Raider 2013 still failed to meet projected sales figures set forth by Square Enix and didn’t turn a profit until January. Now, that’s stupid and is really indicative of an industry that’s begging to have the bottom fall out of it, but the current situation being what it is you’d think they’d be looking for ways to sell as many copies as possible with this next entry, instead of artificially limiting themselves to a consumer base that’s less than ⅓ the size of the total market. The only way this could make sense is if they’re getting a huge, and I mean a huge cash influx from Microsoft in an attempt to trump up the appeal of the system. If that is indeed the case, as financially would seem to be the only option, that’s a little bit ridiculous. Microsoft is plainly feeling the hurt from the beating it’s been taking in the console market, and their solution is apparently to throw money at the problem and hope it goes away. Tomb Raider was a great game, and an excellent reboot, but years of stagnation have robbed it of the star power that it used to command. It lacks the persuasive power of something like Halo and likely will not convince people to jump ship to the Xbox One, at least not in the numbers Microsoft is hoping for. Look, Microsoft is a business and their purpose is to make money. They are well within their rights to implement whatever means they see fit to meet those ends. The trouble here is that instead of trying to make their platform better, they’re simply attempting to buy success. While huge piles of money do undoubtedly make for a more attractive environment for third-party developers, it’s hard not to feel like the whole thing is a little sleazy; couldn’t cut it in a fair fight? Buy off the competition and hope enough people feel the need to raid tombs so that the move will be profitable. Now, it’s still possible that this whole thing is just a dog and pony show. Microsoft will shovel out some money to get Tomb Raider exclusively on the Xbox One for six months or so. They get to maintain the illusion of exclusivity for a bit and hopefully rope in a few new customers and Square Enix can then go on to release on PS4 and PC and gain all those additional sales. We’ve seen this kind of thing before, most recently with Ryse after Crytek realized how much of a financial misstep it was to isolate themselves like that. But in the meantime, it’s leaving a sour taste in the mouths of what might otherwise be loyal customers. For a time, Microsoft will get to tout itself as the sole custodian of Tomb Raider, and they’ll likely get some business out of it. But while that’s going on, there’s a bunch of fans sitting on some pretty serious resentment. We don’t see much of this kind of thing much in other mediums: I’ve never put a copy of The Avengers into my Blu Ray player and had it refuse to play it because Disney only releases Samsung-compatible discs. Consumers don’t like to be arbitrarily locked out of content, and to do so is a staunchly anti-consumer practice. Audiences lose because they don’t get to play what will hopefully be a great game. Square Enix loses because they’re the ones who are decimating their potential market when they could have the entire spectrum of platforms to draw from. And it’s possible that even Microsoft loses because if this backfires as it likely will, they’ll have dealt a pretty serious blow to a franchise that was finally getting its legs back under it. If it goes under, then there’s no more profit to be found there for anyone. At the moment, Microsoft has gained itself a decent-sized feather for its under-sized hat. They’ll get to guzzle from the faucet of exclusivity while everyone else licks their parched lips and looks on in indignation. It’s unlikely that they’ll ever feel any repercussions from this like Square and the players stand to. It’s making money, which is their purpose, and I can’t fault them for making a business decision that is beneficial to them. But I can fault them for being jerks about it.